One of the greatest benefits of working with an affiliate network is the fact that you don’t have to keep track of each merchant and its payments separately. Instead, merchants pay Shareasale directly and then Shareasale keeps track of your total payments from all merchants. You get a single payment each month, assuming that you meet their minimum payment threshold. You also get the trust and guarantee from Shareasale that the money will be paid out in full and on time. It’s a weight off your mind not having to chase multiple small affiliate programs for your earnings. Not only are consolidated payments easier for you in terms of processing, but they also save you from the need to meet minimum payment amounts for a large number of separate merchants. For Shareasale, the minimum payment threshold is $50. Whether you earn all $50 from one merchant or you earn $1 each from 50 different merchants, you will be eligible for a payment. If you would prefer to get paid only when your earnings meet a larger amount like $500 or $1000, you can go to the "Edit Account Settings" link in your dashboard and change your preferences. When you log into Sharesale, you’ll be able to quickly and easily see your balance in the upper left-hand corner of your user dashboard. To view a more detailed account of your sales, you can click on "Activity Details" and select the date range you’re interested in viewing. Here, you’ll see the specific merchants and amounts that relate to each individual sale. At the end of each month, Shareasale makes a note of all affiliates who have reached their preferred minimum payment threshold. At that point, all commissions are put on hold until the 20th of the month. That delay is both for administrative purposes and because it’s important for Sharesale to give merchants time to reverse commissions if necessary. As an affiliate, it’s always frustrating to have sales voided. In most cases, however, the merchant is justified in doing so. Often, affiliates fail to read the detailed terms and conditions for each program, leading them to take actions that may not actually be permitted. Many merchants, for example, do not allow affiliates to bid on their trademark/company name in search engine ads. Affiliates who skip over the terms and decide to do that anyway are not only at risk of losing their commissions but they can also be removed from the entire network. In other cases, sales are reversed because the customer returned the product or because the purchase was made with a stolen credit card. These reversals are considered acceptable because the merchant isn’t actually getting paid for the sale. If you feel you’ve had a commission reversed unfairly, you should submit a support ticket to the Shareasale team and state your case in a calm and rational fashion. They’re always happy to investigate further on your behalf. is the source of your traffic relevant to Chinavasion, are the people interested in buying something? are you sending them to the right page on Chinavasion? are you simply sending raw "go here now" traffic, or are you pre-selling the customers, or even creating additional value such as foreign language help pages before they visit Chinavasion? Occasionally the purchase was made by a fraudster using a stolen credit card. We cancel the transaction, refund the payment, and no commission can be paid. You are not allowed to receive commission from orders which you placed yourself. This is called "self-referral" and that is not the point of the Affiliates Program! Customer cancelled the order. Sometimes the customer pulls out of the order before it is sent out. In these cases we just refund the customer in full and the commission has to be cancelled. On the 20th of the month after you meet the $50 minimum, Shareasale will issue your payment. Depending on the options you’ve selected in your "Edit Account Settings" page, you’ll receive your payment by either check or direct deposit. For United States affiliates, there is no charge for a basic postal mail check or a direct deposit. For international affiliates, there is an added fee for the delivery of a physical check. If you ever need to view your payment history, you can do that very easily, too. Simply go to the "Activity Details" area of your dashboard and scroll down the merchant list until you see Shareasale in the list. 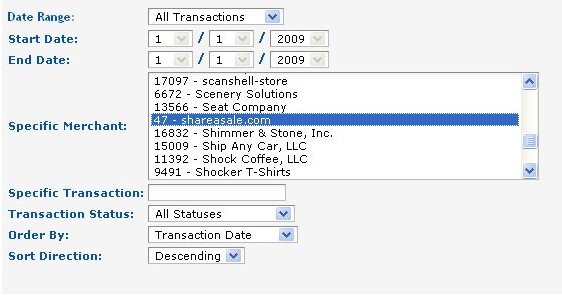 Once you select Shareasale and refresh the report, you’ll see a record of all payments issued to you over the selected date range. As you can see, getting paid and keeping track of payments is exceptionally easy with Shareasale. With a bit of hard work, learning, and testing at the start, you’ll be tracking your own ongoing payments in no time at all. Chinavasion Affiliates: How You Can Earn $$$ Commissions!